We are book lovers here at Our Little House in the Country. Our home is full to the brim with books. I recently donated about 10 large boxes of books, mostly novels, in order to make room for the rest. I have been collecting children’s books for over 15 years and we have hundreds. We have picture books, board books, children’s novels, non-fiction books, story anthologies, pop-up books, lift and flap books, you name it we probably have it! Both of my children love to read and look through their books. I have tried to encourage this by displaying the books in a way that is child friendly and accessible for a 2 year old and a 4 year old. 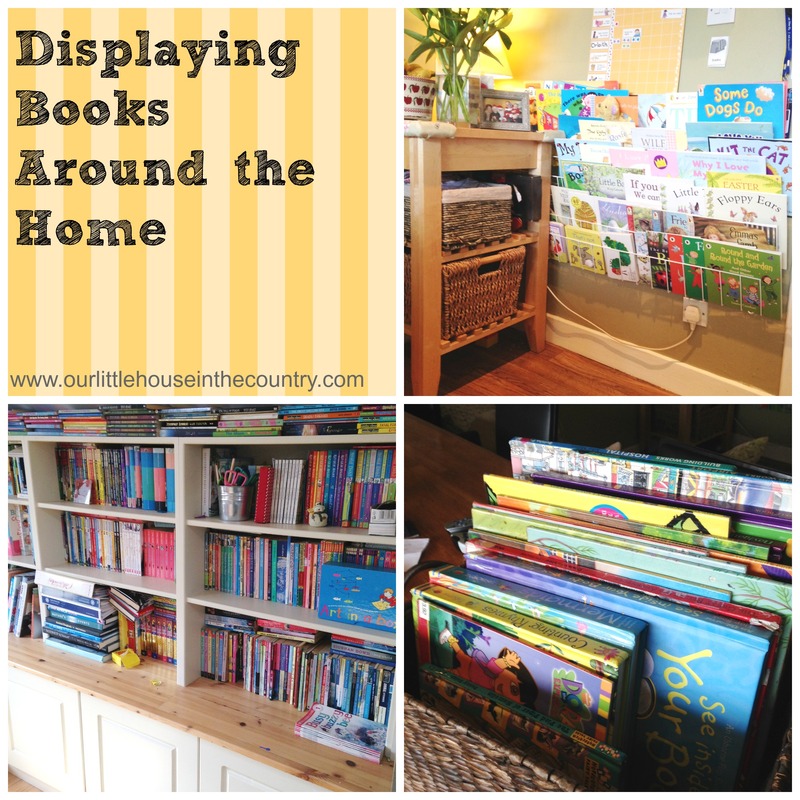 Today I am sharing with you some of the ways we have displayed books around our home, enabling Oodles and Doodles to pick up a book whenever they choose. A Toddler’s Room: In Oodles Room, I wanted to be sure that she could easily take a book and look through it or choose one for story time. Using a cot side as a display rack: After she moved from a cot to a bed last summer I placed one of the cot sides against the wall and I have hung her board books from the bars. She can easily pick a book, read through it and replace it on the bars. It also looks great – children’s books are so beautiful and the variety of gorgeous illustrations is a lovely addition to the decor of her room. Baskets: I have placed some of her favourite, larger picture and story books in a basket on the floor beside the rack so that she can root through it whenever she likes. She also has a bean bag in her room and can often be found snuggled on her bean bag reading through her books. Shelves: on one of her dressers there is a small shelf that is perfect for displaying and storing her smaller books and other board books. It is in easy reach and very accessible. 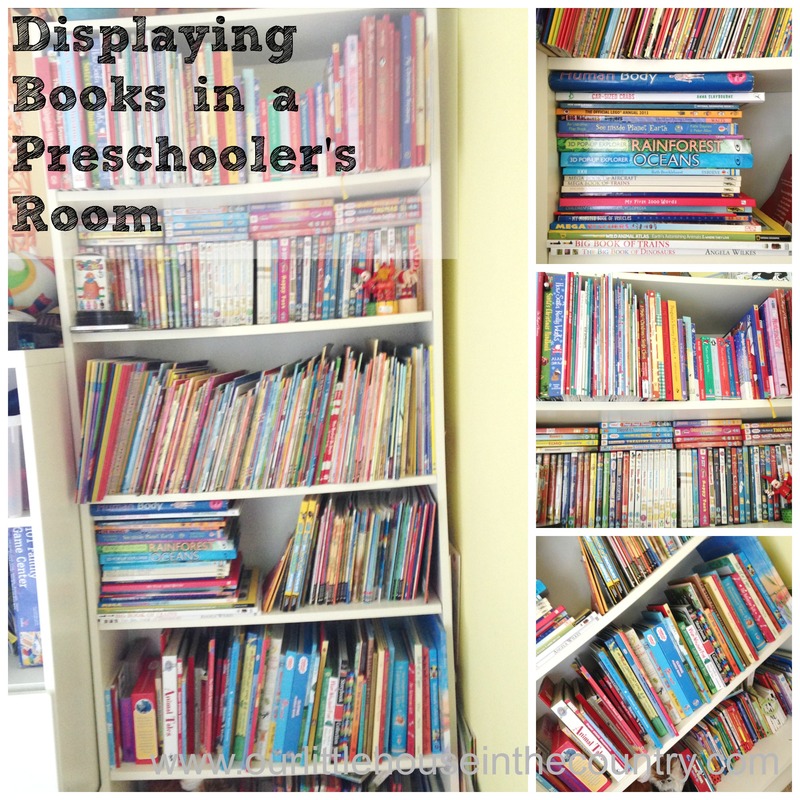 A Pre-schooler’s Room: Doodles is book crazy. There are little piles of books all over his room. Creating a Library Corner: as D has so many books in his room and because he loves to read so many of them we decided to install a large shelving unit that would store most of his books. We created a library corner in his room with the shelves, a bean bag and cushions. The upper shelf contains all of our Christmas and winter themed books. I have stored them up high as we take them down to display in our kitchen in the run up to Christmas every year so as a way of keeping them interesting I put them up out of reach for 10 months of the year. He has a shelf of non-fiction books, another for story and picture books, another for hard-back books and anthologies and another for smaller books, paperbacks, board books, and comics. Around our Home: I try to ensure that there is a t least a basket containing a few books available to the children in every room in our home. Kitchen book rack: last year I found this fantastic book rack at work – it was being thrown out and I opted to take it home. It holds a huge number of picture books. Every 6 weeks or so I rotate the books on this rack – in November and December I take down all of our Christmas and winter themed books and display them here, we then try to read as many of them as possible over the festive period. At the moment I have all of our Spring themed books on display. At other times of the year I display animal themes, friendship themes etc. and sometimes just a selection of everything we have. Everyone who visits our home remarks how great this rack is. Baskets: We visit the local library every couple of weeks and D and O always bring home as many books as they are permitted – about 20! Trying to keep track of these could be tricky, so we keep them in a basket in the living area of our kitchen. The books are kept together, they are read and we can ensure that they are returned on time to the library. Office/playroom: A few years ago we had custom made shelves installed in our office/playroom. The photos I have do not do this area of our home justice. These shelves house some of my books, books for D and O for when they are a little older and are interested in or reading children’s novels. This is where I keep my first edition Harry Potters and my full set of Roald Dahl books from my childhood. We have shelves of art books, travel books, medical books, French books etc. – it is our very own library. We will have to extend this eventually as we have already run out of space. Totes: I keep a number of fabric tote bags in my car with a variety of books in them. One contains our religious themed books and prayer books for keeping O entertained at Mass each Sunday. Another has a variety of story books, puzzle books, colouring books to keep little people busy when we are out eat or visiting. These are just some of the ways in which we display books in our home in an attempt to encourage reading and a love of books. I am constantly finding other ways to store and display our collection. 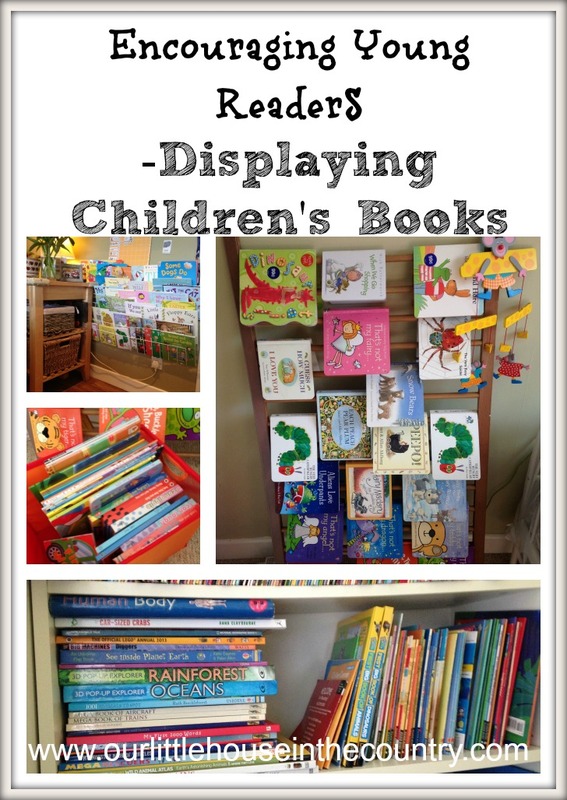 I would love to hear from you and your ideas for displaying children’s books. I love that you have a basket of books in every room of your home. What a great idea! Thanks. It’s a simple little idea but works really well. Thanks for taking the time to read my post! We have books everyone too- and I mean everywhere! Found you via the hdydi link up. Thanks for the extra ideas too. You are a decorator after my own heart. I can’t get enough books for me and the little one! Pinned you from the Pin It Party! Hi there, thanks for taking a look and leaving a lovely comment. Don’t think you can ever have too many books! Wow, you have a lot of books! That is really awesome. 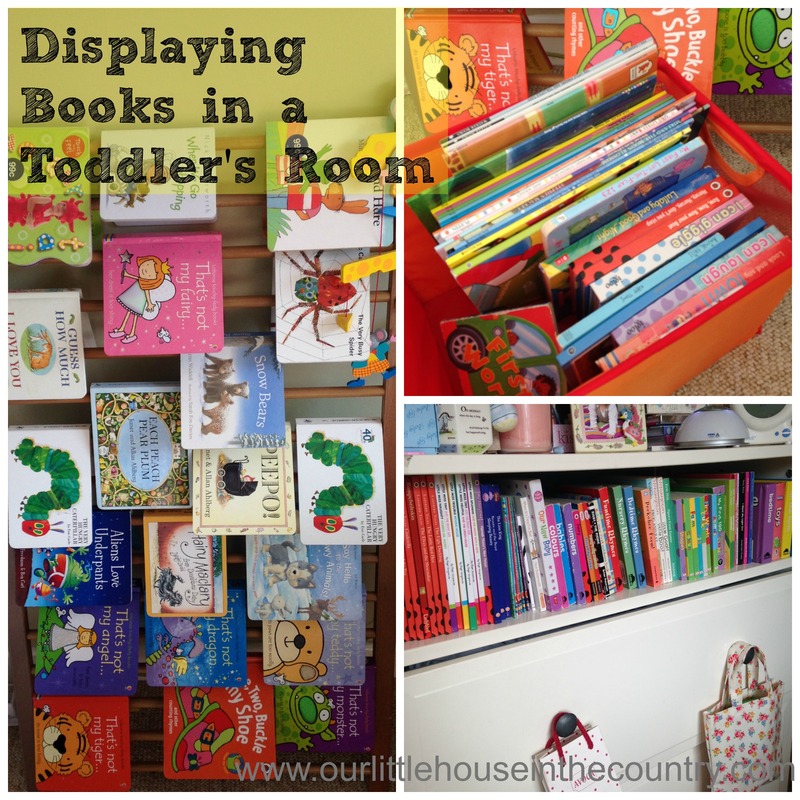 I love your idea about displaying books on the side of a crib – I am going to try that one! I decided to reshare this post from a couple of months ago following a chat on Instagram this morning! This is how we display our books as a way of encouraging Doodles and Oodles to regularly engage with books! Great post.Love the side of the cot idea! Thanks a mil Aedín. The cot side is perfect for all those little board books!